Pagosa Springs, CO -- It didn’t take long after Tim O’Brien, Pete Wernick, Nick Forster, and Charles Sawtelle first appeared onstage together in 1978 for the bluegrass music world to realize that the Colorado band, Hot Rize, was something special. By the time they bowed off the stage as a full-time act in 1990, they’d not only climbed to the top of that world as the International Bluegrass Music Association’s very first Entertainers of the Year, but their stature was recognized across the board, with a nomination for a then-new bluegrass Grammy, a four-star album review in Rolling Stone, tours across four continents, and a legion of up-and-coming, broad-minded young musicians learning their songs and singing their praises. Nashville, TN -- Widely known for his work in cutting-edge string band music as a founding member of Punch Brothers, Grammy-nominated Noam Pikelny has emerged as the preeminent banjoist among a new generation of acoustic musicians. Already praised as “a player of unlimited range and astonishing precision” by comedian/banjoist Steve Martin, Pikelny now presents his new concept album, Noam Pikelny Plays Kenny Baker Plays Bill Monroe (October 1st), a unique interpretation of traditional Bluegrass through a bold, complete adaptation of one of the most influential instrumental bluegrass music records of all-time. Joining Pikelny on this tour de force project are the finest instrumentalists in bluegrass: Stuart Duncan (fiddle), Bryan Sutton (guitar), Ronnie McCoury (mandolin), and Mike Bub (bass). Listen to the track "Big Sandy River" here. Nashville, TN (July 25, 2013) —Renowned banjoist Noam Pikelny will deliver the keynote address during International Bluegrass Music Association’s World of Bluegrass 2013 event, which takes place September 24-28 in Raleigh, North Carolina. Nashville, TN -- Compass Records recording artists received two out of the five nominations in the category of Best Bluegrass Album during last night’s Recording Academy announcement for the 55th Annual GRAMMY awards. Albums nominated include banjo virtuoso Noam Pikelny’s dynamic solo album Beat The Devil and Carry A Rail and Special Conensus’ critically acclaimed Scratch Gravel Road. The awards will be held on February 10th at the Staples Center in Los Angeles and will be broadcast live at 8/7c on CBS. 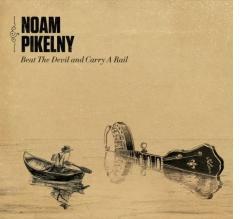 Banjo artist Noam Pikelny has announced a series of solo Beat the Devil and Carry a Rail shows. This series will primarily focust on venues west of the Mississippi River. Noam Pikelny's tour for his outstanding new release, Beat the Devil and Carry a Rail began in Lexington, Kentucky yesterday. Undeniably the next big thing to happen to the 5-string banjo, and member of Grammy-nominated Punch Brothers, Noam Pikelny helped to broaden the awareness of the banjo in the mainstream -- with Beat The Devil and Carry A Rail. Undeniably the next big thing to happen to the 5-string banjo, and member of Grammy-nominated Punch Brothers, Noam Pikelny has helped to broaden the awareness of the banjo in the mainstream -- with new album Beat The Devil and Carry A Rail debuting this week at the #27 slot on the Billboard Heat Seekers chart. The long awaited second album from Punch Brothers' banjoist and winner of the 2010 Steve Martin Prize for Excellence in Banjo and Bluegrass. Album features: Jerry Douglas, Aoife O'Donovan, Tim O'Brien, Steve Martin, Bryan Sutton and Chris Thile. Free Download of "Jim Thompson's Horse" Available on NoamPikelny.com.